NEW YORK • Meet the newest Barbie, who has dark skin, the muscular thighs of an athlete and a hijab. 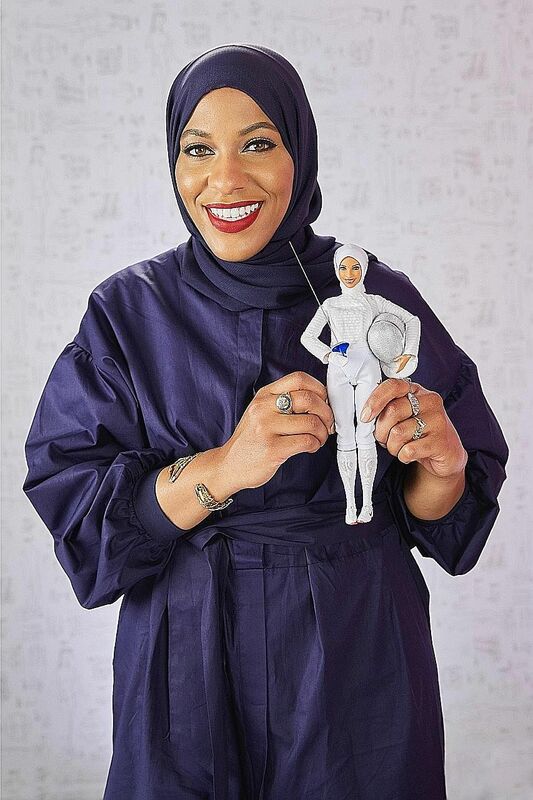 The doll, modelled after Olympic fencer Ibtihaj Muhammad, was revealed on Monday evening at the Glamour Women of the Year Awards in New York. Ibtihaj, who was the first American athlete to compete in the Olympics in a hijab, won a bronze medal in the team sabre event in Rio de Janeiro last year. The fencing mask, the uniform and the "Olympic-medal-thick" legs were all there, Ibtihaj noted while introducing the doll onstage at the awards show. And for the first time in Barbie's existence since the 1950s, there was a white head scarf tucked tightly around the doll's face, with not a wisp of fake hair in view. "Perfect hijab moment right here," Ibtihaj, 31, said, turning the toy this way and that. In an interview on Tuesday, she recalled how important it was for her to play with dolls as a child - even as she was pursuing sports - and "envision myself in places where society told me I did not belong". She said that having a doll modelled on a strong Muslim woman was "revolutionary", particularly at a time when some of the national discourse is fraught with bigotry. "There is so much focus on Muslim women in hijab and oppression and being docile," she said. "This is flipping this entire bigoted narrative on its head." The hijab-wearing Barbie is part of the "Shero" line of dolls from Mattel that is based on inspirational women who are breaking social barriers, including Misty Copeland, who was the first African-American female principal dancer with the American Ballet Theater, and plus-sized fashion model Ashley Graham. Introducing the toy at a women's awards show highlighted Ibtihaj's status as an accomplished athlete and the role that Barbies have played in the formative years of American girls. There was a range of reactions to the new doll online and Ibtihaj said she had braced herself for a backlash. "As a public figure who is Muslim I am very accustomed to trolling - that is a part of my life," she said. "But it is still very shocking to me to read the very negative comments about dolls.
" We are still in a moment where we are unearthing this bigoted America that we all hoped and prayed did not exist." Mr Ibrahim Hooper, spokesman for the Council on AmericanIslamic Relations, said that after the doll was announced, he heard a radio broadcast about it that included derogatory and sarcastic language, including whether the doll would be "strapped with bombs". "The haters are out in force against this," he said. "Hijab is like a red flag to the Islamophobes." He pointed to numerous occasions when Muslim women have been singled out by their head coverings and verbally or physically attacked. "The fact that the cottage industry of Islam bashers has crawled out from under their rocks to attack this relatively benign manifestation of Islam in America is an indicator of where we are at," he said. Ms Michelle Didoni, a Mattel spokesman, said on Tuesday that the doll was inspired by the company's push to include a more diverse array of skin colour, professions and body types in the Barbie line. "Barbie the icon has created a lot of conversation around women and women's roles in the world and she has really swung with the times," she said. "She is a lightning rod for conversation."